Sinn Fein’s Northern Ireland leader Michelle O’Neill. SINN Féin is ready launch a ‘Mary Lou for Taoiseach’ campaign whenever “the love-in is over” between Fine Gael and Fianna Fáil. The party’s Ard Fheis has heard a string of election promises from Pearse Doherty, including the abolition of third level fees. In a clear move that Sinn Féin is ramping up for an election, their finance spokesman said they will introduce a living wage and implement a universal healthcare. “So whenever Leo and Micheál decide the love-in is over, and an election is called, they will know – Sinn Féin is ready,” he told delegates in Belfast. Mr Doherty said the party would “create a modern economy”, although he didn’t set out any specifics for how the party will pay for the proposed measures. In their pre-Budget submission last year, the party proposed an extra €2bn in taxes. But last night Mr Doherty said that in government Sinn Féin would “free families from the unrelenting burden of worry and insecurity”. “We will begin implementing our plan for universal healthcare, free for every citizen as a birthright. “We will abolish all student fees, create thousands of apprenticeships, and unleash the potential of our young people,” he said. 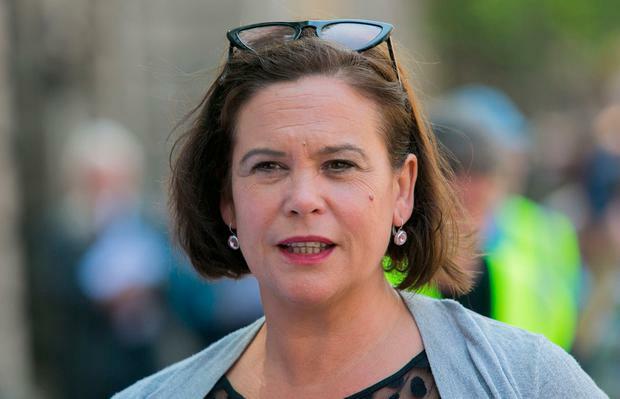 In her opening contribution, the party’s deputy leader Michelle O’Neill made it clear that the party intends to pitch Mary Lou McDonald as a potential Taoiseach whenever an election is called. She said Sinn Féin “stands for women”. “And surely you agree it is time for a woman Taoiseach to lead the next Government. “And surely you know that woman is Mary Lou McDonald TD,” she said. Two motions to be debated at the conference today relate to Sinn Féin’s position on abortion. Although backing the repeal of the Eighth Amendment in the recent referendum the party is not currently in a position to back the legislation proposed by the Government. A motion placed by party bosses would allow them set party policy on the issue rather than leaving it in the hands of the membership. The proposal is expected to pass although there will be some opposition, including from Meath TD Peadar Toibin. Kirsty Blake Knox: Who will put on a better show: El Papa or Britney?